HPCL Recruitment Notification 2017 60 Technician post the release of vacancy post before 08-06-2017 to check the official notification Description of the application are required for All interest candidates jobs eligibal students & studentgirls Apply Online application to all students and check are that the recruitment application like - Before education and application, the information on the official notification website should be read and the job seekers who are interested and applying will apply after obtaining all the information and www.govtjobscare.com will continue to provide updated updates daily. Total Post Number - 60 posts. Name of State – All Indian. 2. Technician Boiler - 10 posts. Required Age - Candidates upper age limit should be between 18 to 25 Years as on 01-05-2017. All Candidate will be applicable as per the rules. For Age Details Go To Detailed Advertisement. Qualification - All Interested Students should have complete Diploma in Chemical / Mechanical Engineering or its qualification Form a Required Board/University. For Post Wise Qualification Go To Detailed Advertisement. Selection Mode process - All Students will Be Selected on Their Performance In Written Test / Computer Based Test, Skill Test, Medical Examination. Examination Fee - General/OBC Candidates Application Fee is - 600/- & For All Other Candidates (SC/ST/PWD ) Application Fee is - Nil. 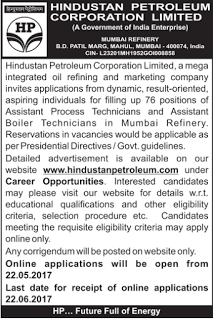 All Students may fill the Online application through official website http://www.hindustanpetroleum.com Before Submit Form, Students Read Official Notification And then apply only. HPCL Recruitment Notification 2017 76 Assistant Process & Boiler Technician post the release of vacancy post before 22-06-2017 to check the official notification Description of the application are required for All interest candidates jobs eligibal students & studentgirls Apply Online application to all students and check are that the recruitment application like - Before education and application, the information on the official notification website should be read and the job seekers who are interested and applying will apply after obtaining all the information and www.govtjobscare.com will continue to provide updated updates daily. Total Post Number - 76 posts. 2. Assistant Boiler Technician posts. Required Age - For Postwise Age Details Go To Detailed Advertisement. Qualification - For Post Wise Qualification Go To Detailed Advertisement.